Home PBA Philippine Cup 2019 Sports 2019 PBA Philippine Cup: Schedule, Results and Standings. 2019 PBA Philippine Cup: Schedule, Results and Standings. PBA: Philippine Cup 2019 - Schedule, Results and Standings. Game 1: Rain or Shine Elasto Painters (91) vs. (85) Global Port *RAI advances to semi-finals. 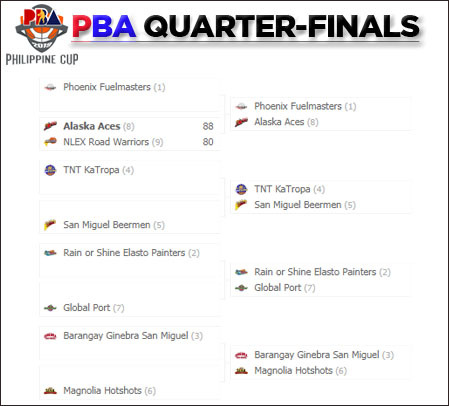 Game 2: Phoenix Fuelmasters (91) vs. (76) Alaska Aces *PHO advances to semi-finals. FIBA World Cup 2019: Philippines (Gilas Pilipinas) Schedule, Result and Standings. Regular and Special (Non-working) Holiday for Calendar 2019. Republic Act No. 6758 Section 8: Salaries of Constitutional Officials and their Equivalent. PRC: Schedule for Licensure Examination for 2019. Election 2019 : ARMM (REGIONAL) - Tentative List of Candidates for Local Positions. Election 2019 : ARMM (BASILAN) - Tentative List of Candidates for Local Positions. Election 2019 : ARMM (LANAO DEL SUR) - Tentative List of Candidates for Local Positions. Election 2019 : ARMM (MAGUINDANAO) - Tentative List of Candidates for Local Positions. Election 2019 : ARMM (SULU) - Tentative List of Candidates for Local Positions. Election 2019 : ARMM (TAWI-TAWI) - Tentative List of Candidates for Local Positions. Election 2019 : NCR (MANILA) - Tentative List of Candidates for Local Positions. Election 2019 : NCR (2nd District) - Tentative List of Candidates for Local Positions. Election 2019 : NCR (3rd District) - Tentative List of Candidates for Local Positions. Election 2019 : NCR (4th District) - Tentative List of Candidates for Local Positions. Election 2019 : NCR (House of Representatives) - Tentative List of Candidates for Local Positions. Election 2019 : Region VII (NEGROS ORIENTAL) - Tentative List of Candidates for Local Positions. Election 2019 : Region VII (SIQUIJOR) - Tentative List of Candidates for Local Positions. Election 2019 : Region VII (CEBU) - Tentative List of Candidates for Local Positions. Election 2019 : Region VII (BOHOL) - Tentative List of Candidates for Local Positions. Election 2019 : Region XI (DAVAO OCCIDENTAL) - Tentative List of Candidates for Local Positions. Election 2019 : Region XI (DAVAO DEL SUR) - Tentative List of Candidates for Local Positions. Election 2019 : Region XI (DAVAO DEL NORTE) - Tentative List of Candidates for Local Positions. Election 2019 : Region XI (COMPOSTELA VALLEY) - Tentative List of Candidates for Local Positions.